The story of Solairus Aviation® can be said to be one of resilience. Founded in 2008, just as the Great Recession began to rear its ugly head, one could’ve thought that such a company—and an aviation company at that—would eventually flounder and find itself in the maws of such economic misfortune. But contrary to popular belief, Solairus instead has continued to hold on tight, slowly and steadily growing its fleet in the years that followed. One could chalk up Solairus’ success to a number of reasons. For one, being a company that’s grown in the midst of turbulence, it’s keen to see any changes or trends happening within the landscape that it can integrate into its services. For another, it was established by a repertoire of talented minds whose experience helped further Solairus to where it is today. Their jet card program, in particular, has proven to be a formidable addition to the growing list of service providers, with its sizable fleet and flexible pricing. But how does it cope alongside other jet card programs? 25-Hour Card Membership. This option is perfect for those who only need a particular size of aircraft for all your trips. That said, pricing for this service depends on what aircraft size you need—and fortunately, you don’t have to think about paying by the hour. Fixed Dollar Program. If, however, your travel or business needs require a broader variety of aircraft, this service might be more applicable to you. If you choose to avail of this, pricing goes by the hour, with additional payment for fuel surcharge if needed. All this considered, Solairus’ program might be a little pricey for some, particularly if one were to avail of the fixed dollar program. However, considering the company’s sizable fleet and perks included in the pricing, one may argue that the price is well worth the service provided. You’ll have access to 5-star in-flight catering. Seating is spacious and comfortable, able to accommodate 4-8 passengers as well as containing enough storage for baggage. Connectivity and entertainment probably won’t be a problem here, as these packages also come with satellite phones as well as some audio/visual leisure options. You can make use of their high-speed wi-fi for your work and leisurely needs. There are sleeping arrangements available for those taking long-haul flights. Worried about privacy in the restroom? No problem. If you avail of either of these packages, you can access full lavatories inclusive of private dressing rooms. Indeed, at a glance, Solairus’ jet card program might seem a little pricey, mainly since its fleet seems relatively smaller than other providers. However, with its guaranteed availability and price inclusions—not to mention its rate per increment—the price can be well worth the service if utilized correctly. 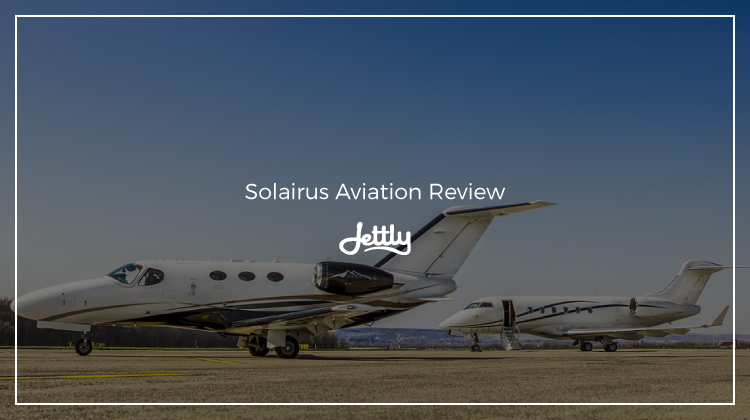 Disclaimer: Jettly is in no way affiliated with Solairus Aviation. Solairus Aviation is a registered trademark of Solairus Aviation and Sunset Aviation LLC.